After May 9, click here for the Voters Guide for the Municipal Primary that will take place on Tuesday, May 21, 2019. Did you know? Many of the races in the 2019 Municipal Election will be similar to those in 2015. You can review the races in the 2015 voters guide. Also! The League of Women Voters of PA offers an online voters guide called Vote411 to all Pennsylvanians. The guide for the 2019 Municipal Primary will go live in late April. Links to this guide as well as links to Vote411 and other useful information for voters can be found on the League of Women Voters of Pennsylvania homepage. The information about the statewide races was collected by the state league. The information about the local races was collected by LWV of Lehigh County. Candidates completed their own online questionnaires on VOTE411 or completed a Paper Questionnaire that they emailed or mailed in to us. Do you know the responsibilities of our county commissioners and other elected officials in the county? Click here for an outline. Timothy A. Benyo, Deputy Chief Clerk, Registration and Elections, sent us spreadsheets listing the races, candidates and their mailing addresses. The day after the deadline for candidates to submit their petitions, clerks enabled us to visit the office so we could write down the email addresses that candidates provided without touching the documents. Thanks to the support of this office, we were able to send letters and emails to the candidates, asking them to confirm the information we had gleaned, their biographical information and responses to non-partisan questions. Thank you to The Morning Call for continuing support of our non-partisan, twice-yearly Voters Guide. We forward candidate information to the Morning Call for publication. This is the version that will be posted at the top of this page. 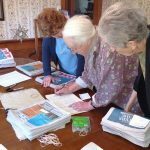 League members met at a member’s home to distribute copies of the Voters Guide. The newspaper always gives us hundreds of extra copies to distribute around the county. This involves a counting party at which members make bundles of varying numbers and mark them for delivery to libraries, community centers, social agencies, and various other places where voters can picked them up. Pat and Burke Swan have offered their home for us to do this. This is the same day as The Morning Call publishes the Voters Guide. Volunteers arrive at 10:30 a.m. or arranged to pick up copies later in the day. We finish about noon, then departed to make our deliveries. 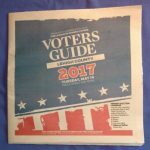 Looking ahead, members, please email at email@lwvlehighcounty.org if you can come to help or distribute copies of the Voters Guide. Thank you.